Jeff Gokee says he hit rock bottom two years ago when his son Cooper was diagnosed with leukemia. He sat on Cooper’s bed, wrought by despair and suddenly having doubts about God’s plan for his family, when Cooper spoke up. 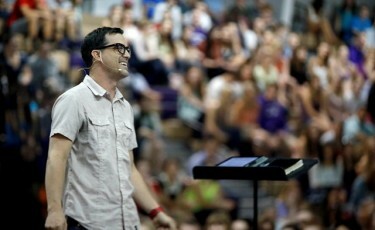 Just like that, his doubts and despair were gone, Jeff told the Chapel audience Monday morning in Antelope Gym. The executive director of Phoenix One used that story to explain how Jesus is always there with us, but we need to give Him control and listen to Him – or, in this case, listen to Him through the inspiration of an 8-year-old boy. 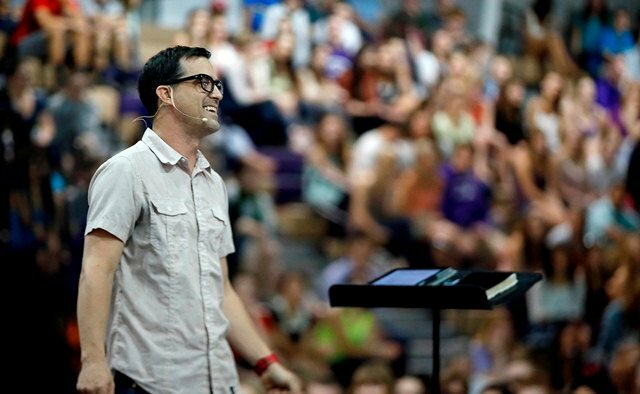 “We often get so wrapped up in our own lives that we don’t even see Jesus in our midst,” Gokee said. Cooper, now 10, was the honorary race starter for last year’s Run to Fight Children’s Cancer on the GCU campus. Jeff said he has learned to trust God’s plan for his son and urged listeners to do the same with challenges they face in their lives. “Pull yourself out of the frustration you feel and allow Him to pull you out of it,” Gokee said.